When taking the train from Glasgow, if you want seats around a table, make sure to reserve them in advance. If you're planning to tour the Oban whiskey distillery, make sure to book ahead, they can get sold out during the summer. It rains in short spurts in the summer but it comes down fast and hard. We went in the middle of June and it was around 60℉ during the day, and with the wind it can feel cold. The museum, castle and grounds are only open April through October. If you are planning to explore Scotland by train I recommend getting the Highland Rover pass which allowed us 4 days of unlimited travel by train, ferry and bus over the course of 8 days. Oban is a small quaint seaside town in western Scotland, a 3-hour train ride from Glasgow. 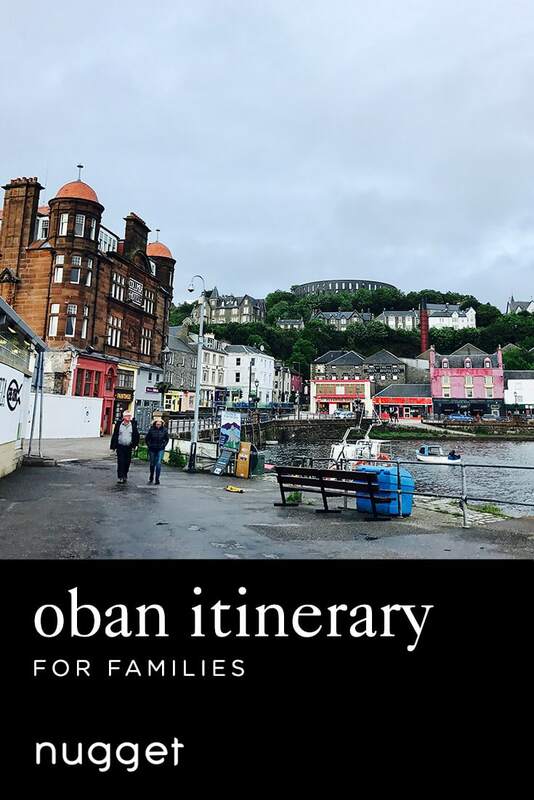 Start this Oban family trip with a leisurely stroll to Dunollie Museum, Castle and Ground and enjoy beautiful views of the Scottish shoreline. Afterward, warm up with hot chocolate and homemade scones at Oban Chocolate Company. When you are ready to brave the Scottish weather again, head out to McCaig's Tower perched over the town. End your day with a delicious seafood meal at the family-friendly restaurant Cuan Mor. The Dunollie site is an ancient ruin on the north side of Oban. From there, you can see the island of Kerrera, the harbour and outlying isles. Walking the trailhead allowed us to enjoy a peek at the other islands and see some bed and breakfasts, each one of them unique, on the waterfront. The stroll to the castle grounds and museum was lovely enough, so we didn't end up going inside the museum. The castle grounds consist of just one tower, but it provides a great view of the shoreline. Just outside the museum, there's a picturesque field where sheep graze on the hillside. DIRECTIONS From downtown Oban, it is about a 35-minute stroll to the Dunollie castle grounds and museum. Walk north along the water and once you see the war memorial, cross over the road to to Dunollie's Woodland Trail. It's a nice green trail covered in foliage and big trees. We used our stroller and had no problems. TIP It can get very windy since it’s right next to the water, even in the summer. A waterproof windbreaker with a hood is always a good idea. If you want some Scottish scones, this is an excellent place to get them. They offer generous portions of scones, clotted cream and hot chocolate. This is also a great place to hide out from the wind or rain. It's kids friendly, with toys and children's chairs. DIRECTIONS The chocolate shop is on the waterfront, on the way back into town from the castle grounds. McCaig’s Tower is a prominent landmark in Oban. It was built in 1897 by local banker John Stuart McCaig. The circular landmark provides spectacular views across Oban Bay to the Atlantic Islands. DIRECTIONS A brief 15-minute walk up above Oban's town center, you'll find the path to McCaig's Tower. It was so good, we ate there twice during our stay in Oban (2 nights, 3 days). Everything there was well-made and fresh. We got mussels, grilled peach salad and a cheeseburger. DIRECTIONS It is right in the center of town, facing the water. You can't miss it. WE LOVEDIt was right in the center of town, a couple blocks away from the train station and the ferry. We stayed in the two-bedroom apartment which had a kitchen where we could make simple meals. TIPThere is a Tesco supermarket nearby. It is about a 7-minute walk (.3 miles) from the apartment, which is in the center of town. It is about a 5-minute walk south of the Oban train station.